"Would highly recommend to anyone who has thought of trying a class. Thank you." "I finally found something that I have been looking for for years! Wish I did it a long time ago. Thank you Clara." "Thanks for getting me on track with Yoga. I've had so many false starts with it in the past and finally I feel like I've committed fully and I'll be a Yogi forever. :-) All thanks to your gentle yet thorough teaching and the relaxing and refreshing atmosphere in your studio!" 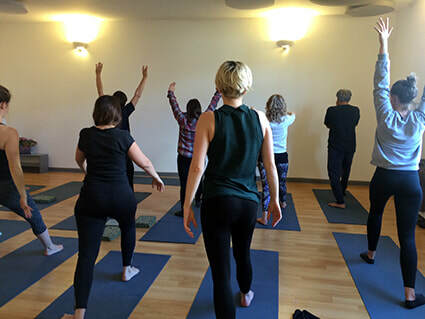 "I am now a regular attendee at a lovely class that I think has made quite a difference to my mental and physical state"
"Your careful teaching and wealth of knowledge is inspiring to keep developing my home yoga." "This class is my essential weekly de-stress"
"I know I'm going to sleep well after my yoga class"
"I haven't felt this way in a long time. Thank you!" "My Osteopath who recommended your class, has remarked that he hasn't seen this much improvement in my spine and back health after only a few months, than in all the years I've been seeing him." "Easier to link breath and movement than courses I've attended before so I can finally relax more, thank you!" "I'm really enjoying a more holistic approach"
"I took this class through my pregnancy and it all helped, especially the breathing. Thank you." "I do love your classes and the breathing aspect has helped me very much. You have a very soothing voice which does go a long way to reducing anxiety."